So I only set one goal for the month of July, and it was a good one! Mostly this is because I was so busy prepping for my Israel trip that I couldn’t think too hard about the month ahead. But also, I really wanted to live well on my trip abroad. And live well…I did! This was a super active vacation with walking and hikes almost every day. Yet, I still attempted to run (two short runs in the crazy heat) and did yoga in the mornings when I could. Since we were typically on the move, there wasn’t much downtime for snacking. But there was plenty of fresh and colorful veggies at every meal and I can see why the Mediterranean diet is so popular. Mentally, I was able to stay present and journal every day. This made for a fantastic vacation which started the month off right. Since then it has been all about marathon training with a little Bikram yoga thrown in for fun! I have been catching up with my family and friends and the BOY and I hosted a Mediterranean BBQ with some of the best food we’ve ever made! It’s amazing to me that tomorrow will be August. How does summer always seem to fly by?! What was the highlight of your July??? My main goal is to support my marathon training so that I can stay healthy and happy as the miles increase! My secondary goal is to raise money in support of St. Jude Children’s Research Hospital as a St. Jude Hero! After a week of talking about it, it was finally time to make Chipotle Turkey Meatloaf for dinner tonight. It’s a good thing that the turkey was still fresh and ready to go! Coming back from Wisconsin Sunday night and leaving again Friday, the BOY and I made a quick and easy meal plan this week. Also planned for this week, a lot of running! I started Monday with an easy 4 miler. One of tips that I picked up from Hal’s book is that not every run needs to be at race pace and that many elite and professional marathoners will do training runs much slower (like 12 minute miles) than they are capable. This information has allowed me to relax a bit about my pace on early week day runs and focus on achieving 9 minute miles on the runs labeled ‘race pace’. The book also talks about early training weeks stating that even if you can run these short distances fast, that is not the purpose of the runs in your training plan. 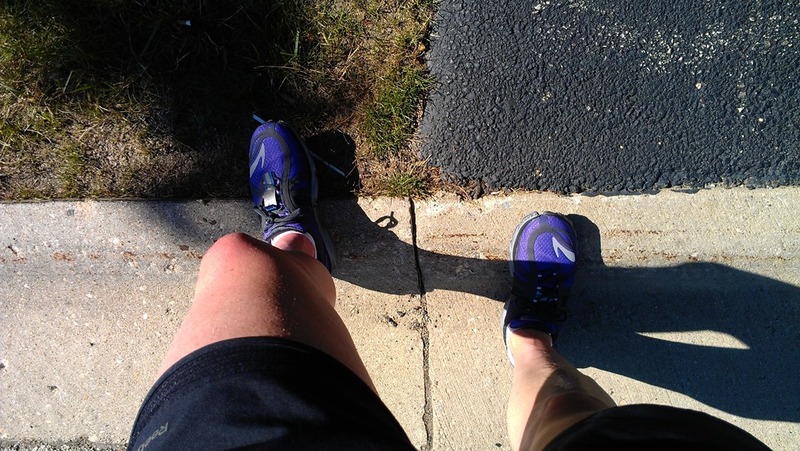 Slower runs are necessary to prevent injury. In all of my years as a runner, I have never read a running book (other than Eat and Run by Scott Jurek earlier in the year), so I am finding it extremely interesting. This morning I hit the 1 mile mark right at 9 minutes and consciously decided to slow myself down a bit. Shortly after, I got lost in my thought and let my body pick the pace. I didn’t run with a fuel belt today so no food or water. I stated to feel a little sluggish and when I looked at my watch, I saw it was 43 minutes, my usual refuel time. 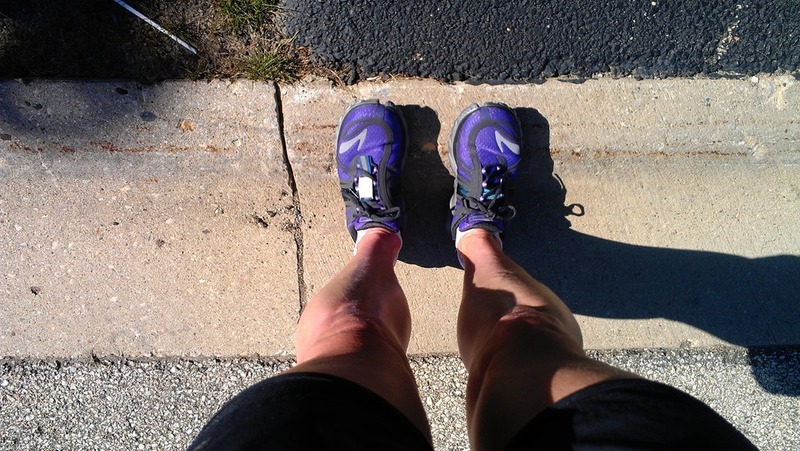 I rediscovered my stride and finished my 7 mile run at 65:09. A great morning run! I know that these 50 degree temps are helping make these morning runs much more fun. It reminds me of my favorite season fall and of course junior high and high school cross country season. When I got home, I had an almond butter and banana as my post race snack and then got to work on making dinner. My plan was to pull everything together so that the BOY could just pop the meatloaf into the oven. We still don’t have onion so I made a few adjustments to the original recipe from Cooking Light, including adding some of my mystery red spice from Israel. When I walked in the door after work, dinner had just 4 minutes before it was ready to be pulled out of the oven. The BOY and I are getting the hang of this tag team dinner thing! And Chipotle Turkey Meatloaf was worth the week wait! Confession: I had just enough time to make the meatloaf, shower, and eat some eggs before it was time to leave for work, I didn’t stretch this morning. Man, my legs are feeling it! I have another 7 miler on Thursday and a long run Friday morning. To prepare meat loaf, remove 1 chipotle chile and 1 teaspoon adobo sauce from can; reserve remaining chiles and sauce for another use. Chop chile. Combine chile, adobo sauce, onion, and next ingredients (through ground turkey breast) in a large bowl, stirring to combine. Place turkey mixture in a 9 x 5-inch loaf pan coated with cooking spray. Bake, uncovered, at 350° for 30 minutes. To prepare topping, combine 1/4 cup tomato sauce, ketchup, and hot sauce in a small bowl; brush mixture evenly over meat loaf. Cover and bake an additional 30 minutes or until thermometer registers 160°. Let stand 10 minutes before slicing. We had our coldest summer weekend in Wisconsin to date! We drove up to Green Lake, leaving around 1:30pm on Friday in the midst of rain storms, but when we arrived the sun was shining and the sky was blue. We able to have Happy Hour on the dock, but needed a few extra layers to stay warm in the wind. We had a stunning sunset, despite all of the clouds, just before dinner was ready on the grill. The next morning, the guys were up early with fishing poles on the dock. I was in need of a 14 mile run. My longest run of the season. I didn’t know any local distances, nor do I have a GPS watch, so I decided that a two hour run would be sufficient. With the hills and strong wind, I figured that might be closer to 13 miles. Since the weather was chilly, I didn’t need to head out early for my run. I was able to take a morning boat ride and enjoy my breakfast. Around 10am, my parents and I got into the car. They volunteered to be my athletic support and help me map out a course. When I read about the Pro Compression sale on Brittany and Megan’s website, I immediately bought a pair. I took some major slack for the bright green color, but I joked that it meant they’d be able to see me from across the lake. Yes, my Mom and I have the same awesome purple running shoes! She was walking while I was running. We were able to scope out a great place to run, mostly around the lake with a few parts along the local highways. I’m familiar with the route as I have biked it a few times before. My parents dropped me off at the bottom of a HUGE hill and off I went. I ran about 6 miles to the park where they were waiting to cheer me on and refill my water bottles. In another hour, they came back to scoop me up. Although my legs were tired and I wasn’t feeling fast, I did feel strong after 2 hours or running. I’m sure the cool weather and amazing family support helped! I finished right around lunch time and returned back to the house to find everyone gathered around the table. I dug right into my homemade hummus before making a salad with leftover salmon for lunch. And sipping on a New Glarus beer. It’s the best part of running in Wisconsin! After lunch we went back down to the docks for fishing round two. My brother and the BOY (on separate docks below) tried their luck with the fish as dark clouds rolled through. We sat under layers of towels for moral support and cheered them on. Throughout the day, the BOY caught three fish, but only one that I captured on camera! Due to the dark skies, we decided to move the day’s Happy Hour to the fire pit which was much warmer than the dock! There was no stunning sunset, but the thick clouds and sprinkles of rain rolling in and out throughout the evening caused quite a dramatic effect. We had another fantastic dinner and then made s’mores (with the giant mallows) by the fire. When we woke up this morning, there was much of the same in terms of weather. Dark clouds and chilly temps! I was thrilled that I had not signed up for the triathlon again this year or I would have been fighting choppy water and heavy headwinds. Should anyone really need this many layers to be outside on a July morning?! We left around noon today and when we returned home, it was actually a gorgeous fall feeling day with the sun shining and clear blue skies! I always feel unbelievable after a weekend in Wisconsin! Luckily, the BOY and I are heading back up on Friday! It was another fun week in marathon training, and I have picked up some tips from reading Hal Higdon’s book. I have to give a huge shout out to my BF Kelley and her Dad, for competing in Ironman Lake Placid today! Way to go guys!!! 1. I went to Bikram yoga again this morning. I must admit…I still don’t get it! 2. I am heading up to Green Lake, Wisconsin today and I seriously just can’t wait! Although I am not doing the triathlon this weekend, I always have the BEST time when I am there! 3. Fridays off is my new schedule from now until the end of the year. I think I’m starting to get used to it! 4. 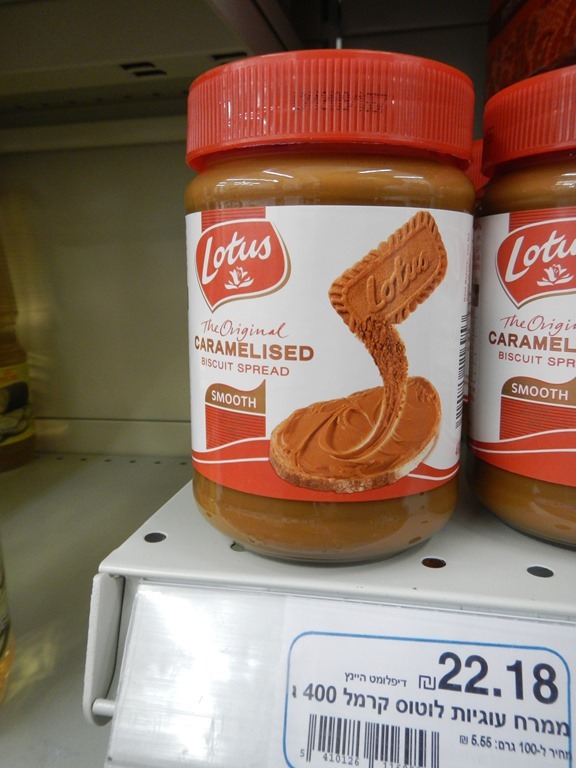 Did I tell you that I found Biscoff in Israel? Not at the Shuk! 5. Speaking of Biscoff, do you know what this means??? If you guessed, Biscoff Puppy Chow then you are CORRECT! Place cereal into a huge bowl. In a microwave safe bowl, combine the chocolate chips, Biscoff, and butter. Microwave for 60 seconds. Stir well until combined and pour over cereal. Stir in powdered sugar, 1 cup of sugar at a time, until all pieces are fully covered. Let cool and enjoy! Or freeze for later! It’s finally cooling off which makes morning runs so much more enjoyable! This morning’s run was a 7 mile race pace run along the path. My race belt and I hit the trail on this gorgeous morning. Since my runs haven’t been real fast, I wasn’t sure what today would look like. But I’ve run a 1:50 half marathon, so I should be able to run 7 miles in less than 63 minutes…right?!. 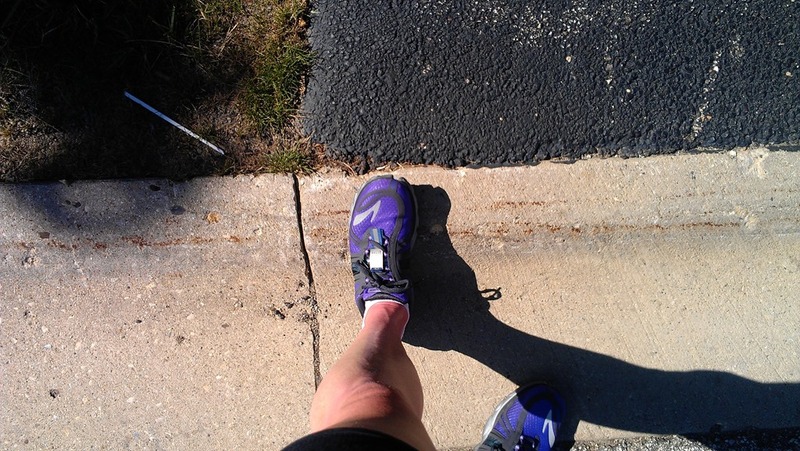 Two miles in I found my stride and felt strong, even with the race belt weighing me down. For fuel, I went with a cappuccino LaraBar (a few bites at 42 minutes and the rest post-run). I finished 7 miles striding into the driveway at 62:28. Hooray for a race pace run (and a slight negative split)! With the marathon approaching, I have been paying attention to stretching and taking time after each run to lengthen my legs and back. When it’s not too hot, I can stretch outside but for the most part, I’ve been working the foam roller and using my yoga strap in front of the TV on the floor of my living room. After my run, I showered and finally took one of my bikes in for a new tire. Both of my bikes have flat back tires, which is a total bummer. Instead of loading two bikes onto my car, I took my hybrid, which I knew I would be using soon. There was a sign saying that the service department was closed today, but a really nice guy working at the store helped me find a new tire and fixed it up for me. I was so grateful! I had just a few minutes when I got home to heat up some leftovers for lunch and throw dinner into the crockpot. I’m telling you, this is ONE EASY MEAL to throw together. I even messed up a few ingredients on my grocery list and made it work. Number one, I only had 1 tablespoon of curry powder left. Yikes! So I subbed in a tablespoon of garam masala and crossed my fingers that they’d blend well. Number two, upon searching the refrigerator drawers for an onion that I thought I saw recently, I came up with only a red onion. Number three, the original recipe is made with sweet potatoes but to save time on chopping potatoes and because the BOY doesn’t like sweet potatoes, I left them out. I’m sure regular or new potatoes could work but then we’re back to the time issue. There was just enough time to change into work clothes, press start on the crockpot (10 hours should do), and walk out the door for work (leaving instructions for the BOY on what to do with dinner). I got home real late tonight and the BOY had already eaten half of the crockpot. I guess it gets his seal of approval : ) I poured myself a bowl over a brown rice mixture and dug right in. Despite a few of my shortcomings on the recipe, this turned out really flavorful and satisfying. I always find myself floored with how good of a cook my crockpot is!!! She is hired for Thursdays the rest of the year! Add chicken breasts, onion, and chickpeas. Gently stir ingredients together to ensure that everything is evenly coated. Cook on Low for 8 hours or High for 4 hours per crockpot instructions. Stir in lemon juice 5 minutes before serving. Serve over rice and with cilantro if using. One last Israel post sharing one of my favorite places in Jerusalem, the Shuk! Wouldn’t this be an amazing place to do your weekly grocery shopping? !